Move upper plate down to touch the base & Zero travel - push the green ON/O button. Or you can Zero anywhere along the travel. 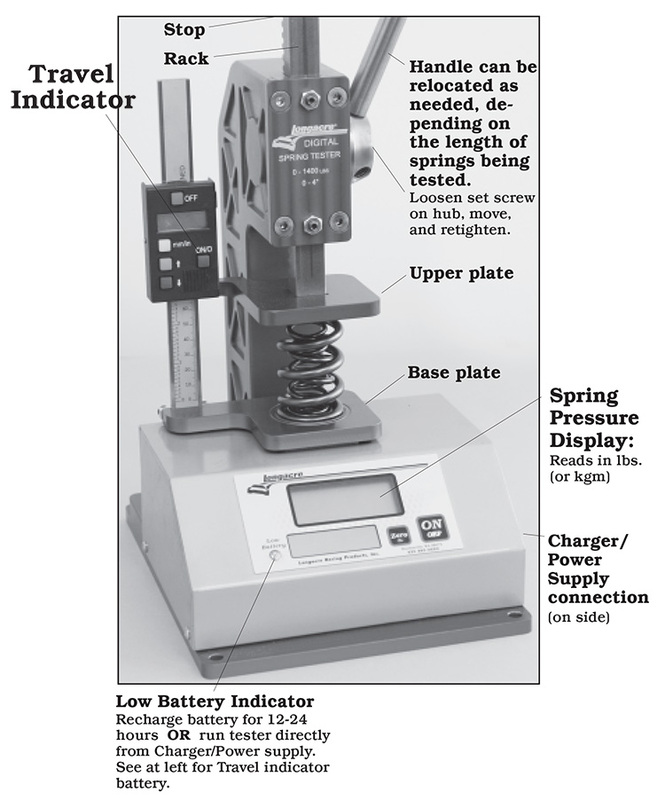 If you Zero when the upper plate just touches the spring it will read the amount you are compressing the spring. Or you can set the stop on the rack at the top to duplicate readings. If you are checking inner and outer springs you should check them with the retainer as the inner spring(s) sit on a step in the retainer and is compressed more than the outer one. To make the travel read correctly when using the retainer put the outer step of the retainer between the upper and lower plates when Zeroing. The travel indicator uses a separate LR44 ‘coin’ battery, installed just under the ON/O button. Low battery is indicated by all digits flashing. Press and hold the Zero button for approx. 5 seconds until you hear a ‘beep’. The display will change to lb 1 with ‘lb’ flashing. Push the Zero button to change to 9 (g for grams) When done push ON to save this setting. This will stay until you change it. Use the same procedure to go back. See below to change to .1 kgm. To convert travel to mm push the yellow button.